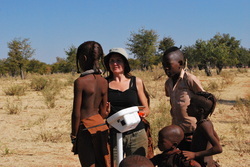 I am also a director of the Kunene Rural Health and Demography Project. 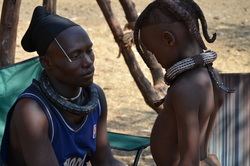 The Himba have one of the highest rates of reported nonpaternity ever recorded. Both men and women engage in long- and short-term partnerships within and outside of marriage. I aim to understand how both men and women make reproductive and mating decisions within the context of these social norms and to determine whether and why particular mating strategies correlate with reproductive success. Scelza, BA. (2011) Female choice and extra-pair paternity in a traditional human population. Biology Letters 7:889-891. 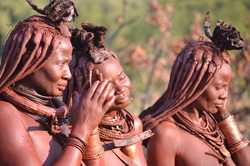 Like most human societies, the Himba rely on extensive social support to raise their children. Within this system, I am particularly interested in understanding the relationship between mothers and their adult daughters, and learning how this pathway of support functions to improve fertility, maternal energy balance and child health. The Himba also rely extensively on fosterage and I have conceptualized this system within the larger framework of cooperative breeding. Scelza, BA (2011) Female mobility and post-marital kin access in a patrilocal society. Human Nature 22:377-393. Scelza, BA (2011) The place of proximity: social support in mother-adult daughter relationships. Human Nature 22:108-127. Scelza, BA; Silk, JB (2014) Fosterage as a system of dispersed cooperative breeding: Evidence from the Himba. Human Nature 25(4): 448-464. Scelza, BA (2015) Perceptions of Polygyny: the effects of offspring and other kin on co-wife satisfaction. Biodemography and Social Biology 61(1): 98-110. In conjunction with my work on social support and cooperative breeding, I am interested in understanding how variation in household demography, marital status and patterns of work affect maternal and child health. I have also begun a collaboration with Katie Hinde to investigate the composition of and variation within women's breastmilk and to learn more about the social context in which breastfeeding takes place.. Finally, I am interested in understanding how women's mating patterns are associated with both their own health and that of their children. Scelza, BA. (2011) The place of proximity: social support in mother-adult daughter relationships. Human Nature 22:108-127. Scelza, BA; Silk, JB (2014) Fosterage as a system of dispersed cooperative breeding: Evidence from the Himba. Human Nature. 25(4): 448-464. Klein, L. et al. (2017) Concentrations of trace elements in human milk: Comparisons among women in Argentina, Namibia, Poland and the United States. PLoS One 12(8):e0183367. I have a continuing interest in the role of fathers as part of the human cooperative breeding system. In particular, in my work I have emphasized the role that fathers can play in assisting their children as those children transition to adulthood. This work has been conducted with the Martu, the Himba and through collaborations with researchers working in China and India. Scelza, BA (2010) Father's presence speeds the social and reproductive careers of men. Current Anthropology 51:295-303. Shenk, MK; Scelza, BA (2012) Paternal investment and status-related child outcomes: timing of father's death affects offspring success. Journal of Biosocial Science 44:549-569.
southwest China. American Anthropologist. 116(3): 591-610.